The Massachusetts State Senate is expected to consider a ban on hand-held mobile electronic devices while driving. Many feel a ban is long overdue and we agree. “Even New Hampshire has gone hands-free. It’s time for Beacon Hill to act,” wrote the Boston Herald editorial board. The Senate is expected to consider the ban Thursday. Under the proposed legislation, Massachusetts drivers could still talk on the phone using hands-free technology. Drivers would receive a $100 fine for the first violation, $250 for the second and $500 for all subsequent violations. Drivers cited three times would receive an auto insurance surcharge. The bill would change the law in Massachusetts for all drivers over 18. Junior operators are already banned from cell phone use behind the wheel. According to the National Safety Council, cell phone use is now estimated to be involved in 26 percent of all motor vehicle crashes. At any given moment of the day, 660,000 drivers are using cell phones or manipulating electronic devices while driving, according to the National Highway Traffic Safety Administration (NHTSA). 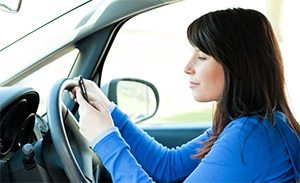 The NHTSA also reported one survey found almost half of all drivers will answer an incoming call while driving. One in four drivers is willing to place a call on all, most, or some trips. In 2010, then-Massachusetts Governor Deval Patrick signed a bill into law which banned texting while driving. The state is in good company; today, 46 states and the District of Columbia have banned texting while driving. By contrast, only 14 states have banned hand-held cell phone use, including New Hampshire, Vermont and Connecticut. Maine and Rhode Island have banned texting while driving but hand-held cell phone bans have failed to gain enough support. Read the Boston Herald’s recent editorial on a hand-held cell phone ban in Massachusetts. The Boston personal injury lawyers at Breakstone, White & Gluck have over 100 years combined experience representing motorists, pedestrians and cyclists who have been seriously injured in car accidents. If you have been injured, it is important to learn your rights. For a free legal consultation, contact us today at 800-379-1244 or 617-723-7676 or use our contact form.